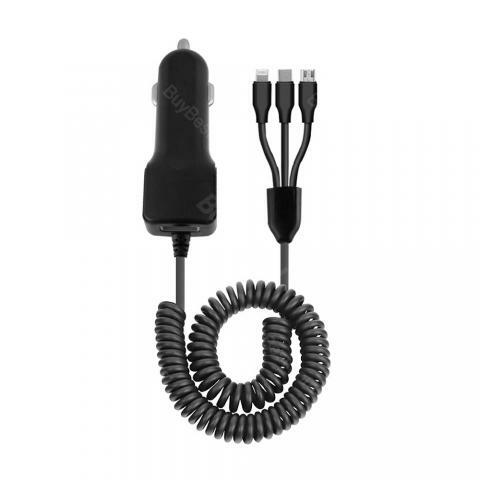 ET NG-1 3 In 1 USB Charger can be used in car to charge Iphone, Android, Type C, which will bring safety and convenience for you. 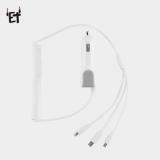 ET NG-1 3 In 1 USB Charger, which adopts built-in IC for automatic identification function, comes with several protections that include short circuit protection, high temperature protection, overcurrent protection to ensure high performance. In addition, it has multiple charging ports to fit to Android, Iphone, Type C. What's more, The high quality material ensures long service time. Just exactly what I wanted. Short cord 3 ft (for my purse) flat, red (easy to pick out from others) and certified Apple. Best part is lightening cable OR micro. Versatile. PERFECT. Couldn't be any better. This is actually a safety feature that prevents damaging devices in case you plug in more than one device at a time, which I wouldn't really recommend! Love this cable. I have an iPad and a Samsung Note 4 and this definitely helps so that I don't have all the chargers lying around. It's convenient, especially since I'm a college student that commutes. This cable allows me to keep my phone and my iPad charged at all times without carrying multiple chargers around. Shipping was fast and it came neatly packaged. Nice to have one cord in the car with options for charging different phones. All three connections work great. The USB charger is multifunction and supports all my family's different cellphones. I'm a cab driver and love the powerful charger. Have recommended this handy charger to my co-workers. The most suitable and versatile usb charger for me. It meets the demands of all my family. The 3 in 1 charge performs great. Thanks for the salesmen’s recommendation. I didn't find this product.